Yay! Our favorite queen of quippy dialogue and creator of our beloved Gilmore Girls is back with a new show. Amy Sherman-Palladino has a new pilot for Amazon and we are so freaking excited for this one. And guess what? You’ll be able to stream it this month! The upcoming pilot from Amazon is titled The Marvelous Mrs. Maisel and according to TV Line “centers on Miriam ‘Midge’ Maisel, whose seemingly idyllic Manhattan existence is upended when she discovers a previously unknown talent for stand-up comedy.” So yeah, that sounds pretty hilarious! 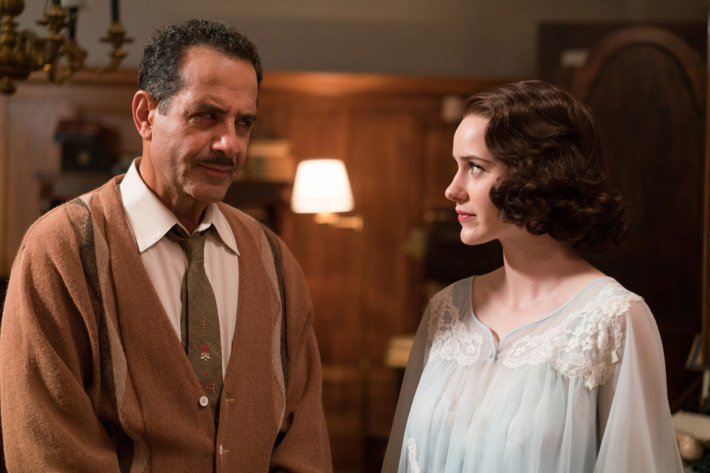 Rachel Brosnahan (House of Cards, Manhattan) will play Mrs. Maisel and Tony Shalhoub from Monk will play her father. Even though Gilmore Girls: A Year in the Life was only released a few months ago, we were already missing ASP and her witty dialogue on our screens. While we don’t have much information about the pilot, we can already start imagining all of the Stars Hollow visitors that could make their way onto the show. We already know how perfect Alexis Bledel looks in 1950s clothes! And Kelly Bishop has appeared in other ASP shows like Bunheads. So, she’d be a perfect guest star too. Unlike other networks, Amazon runs a sort of popularity contest for their pilots to see which ones the audience likes best. So on March 17th the one-hour long pilot of The Marvelous Mrs. Maisel will be available for you to stream and see just how much you like it. And if you want to see more, make sure to let your friends know too!